Orleans the smoky sounds of blues and jazz. Po-boys are the sandwich of choice and New Orleans has an unsurpassed ability to throw some of the best celebrations ever. Mardi Gras, as well as the yearly Jazz Festival, literally draws thousands of tourists to the Big Easy every year, but the world has discovered that there is much more to New Orleans than these annual festivities. Every week throughout the year cruise ships can be seen meandering up and down the Mississippi River carrying throngs of vacationers. 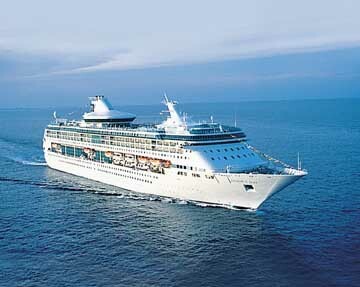 New Orleans acts as a major departure city for many cruise lines before heading off to other exciting destinations. can be heard emitting from the many bars and the majority of the restaurants specialize in French or Cajun fare. The French Market located in Jackson Square is a great place to check Louisiana Jackson Square Cathedral in New Orleans out the locals' wares and it is also one of the oldest, still active farmer's markets in the United States. Afterwards, head over to Caf? du Monde to taste their specialty, beignets. You have not experienced New Orleans if you haven't indulged in these tasty treats. 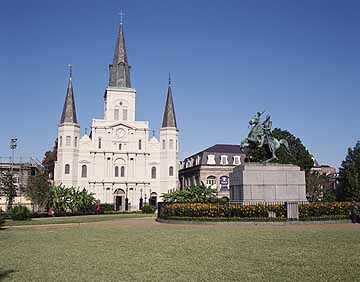 To get a feel for the French Quarter's immense importance to New Orleans take a guided walking tour. Many will be surprised to discover that there is much more to this area than bars and partying. Historical points of interest such as the Mint and the Old Ursuline Convent call the Quarter home. A great way to see other areas of the city is a ride on the St. Charles Streetcar. 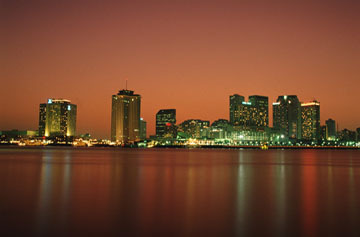 Riders can sit back, relax and truly take in all of the beauty encompassing New Orleans. Beginning in the Central Business District at Canal Street, the streetcar travels through the magnificent Garden District. Magnolias, stately oak trees and palms line the streets and fill the yards of historic homes. Gorgeous homes with wraparound houses, Tulane University and Audubon Park are some of the sights to be seen. Anne Rice, whose novels cast New Orleans as a main character, has two homes in the Garden District. The trip ends at Palmer Park and takes approximately an hour and a half. New Orleans was also home to the esteemed writer William Faulkner. His old home has been turned into a very inviting bookshop that sells many of Faulkner's first editions. Lovers of literature will take great pleasure in visiting this place that was the sight of so much creativity. New Orleans has always had a love affair with the Mississippi River. Various boat rides are offered down this mighty river. A visit to New Orleans will leave a lasting imprint in the minds of travelers of a city that walks to the beat of their own drummer and makes no apologies for it.